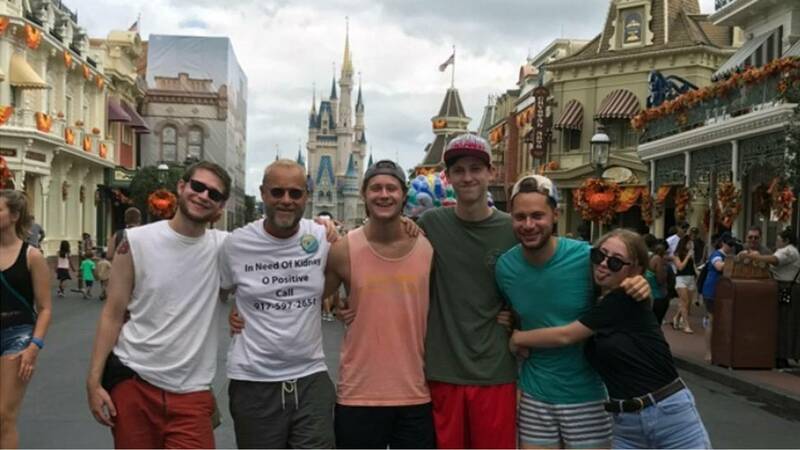 Robert Leibowitz (second from left) poses with his family at Walt Disney World's Magic Kingdom. (CNN) - Robert Leibowitz owes his life to a message on a T-shirt. The Brooklyn native's kidneys were failing --- functioning at just 5%. But the list for a transplant was long and he worried he'd run out of time. So he hit upon a plan. He headed to Disney World. Tourists clicked photos of the shirt. One couple posted their snapshot on Facebook -- and the magic happened. By the end of the day, the post received 32,000 shares. Hundreds of people called wanting to help the man with the shirt. For people in kidney failure, survival can be a numbers game, a game Leibowitz began to believe he just might win. But it was still a longshot. Four people flew to New York for testing. Three were denied. But one man, Richie Sully, was the perfect match. Sully was giving blood at the Red Cross when he spotted the viral Facebook post. He called the number on the T-shirt, and left a voicemail. "Hi, my name is Richie. I saw your post and I'm O positive. I have an extra kidney and you are more than welcome to it." Sully said he thought Leibowitz would not return his phone call because the post had 80,000 shares when he saw it. Sully assumed at least someone had already vowed to help him. "When we actually talked, he told me so many people had called and a large majority of them had flaked," the 39-year-old from Indiana said. "I can't understand the thought process behind seeing a post like that and then reaching out and then completely ignoring him." "He knew he had an expiration date. He knew he had a shelf life. I saw this as a desperate act. I couldn't think of a reason not to call the guy. It's just seem like this is something you're supposed to do."